This year I had the honor or attending all three Camp Improv Utopia camps. I was one of three that completed this feat. I am honored to be joined by both Jaclynn Cherry and Erica Clermont in that. Each camp was unique and offered me a great perspective into my own improvisation and play. The camp season started at West where I was joined this year by my husband, David Vu. He’s not an improvisor, but he’s very witty and funny. I was thrilled that he decided to join me at camp. While he was a little overwhelmed at first, he hit his stride eventually. The greatest moment of camp came right after his first improv scene for an audience. His was the last scene of our set, and it was a great scene. After the show was called, the entire audience cheered and chanted his name. It was probably one of the proudest moments of my improv life. It truly showed me that we, as a community, are incredibly supportive. I saw a side of the man I’ve known for the last 14 years of my life that I had never seen before. Be supportive on stage and in life. I arrived at Yosemite excited to learn about the JTS Brown from Craig Cackowski. He’s an improvisor that I’ve taken a workshop with before and have seen perform several times. He’s a caring and thoughtful teacher. He offers good and direct feedback. He shares his thoughts willingly and openly. What I got out of the form more than anything, is that anything is possible in your show. You can make a big bold move. It will be supported. It will make sense eventually. Don’t judge the move. Just make the move. I felt truly empowered. We got to spend a day in Yosemite, a place that I truly love and hold dear to my heart. Walking through the park with some old friends was an experience I won’t soon forget. Many hadn’t been to the park, and I got to experience their joy at seeing the spectacular views for the first time. It was a beautiful day, and I was reminded of my takeaway from camp over and over in the park: Just make the move. I lastly made a trek out to Pennsylvania the week following my time in Yosemite. I had been to East Camp in its first year. I returned to a camp much bigger than West or Yosemite. There were a lot of new faces, several familiar faces, and all were great friends by the end of the weekend. From two great instructors, James Quesada and Isaac Kessler, I was reminded that I needed to find joy in my play again. I have a lot of fun playing in my weekly show with a team of good friends and strong players, but I don’t think I’ve had the joy that I once had. I was also inspired by watching one of my first students, Alex Lee, get such enjoyment and energy from a rousing game of “Pass the Clap”. His energy was infectious. I could not help but to think about Liz Lemon’s line from 30 Rock, “I want to go to there.” Be joyful. Since my second camp, I have tried to get a selfie with everyone at camp. I never made it…until East Camp this year. Heading to the cabin shows, I had only a handful of people left to capture. I made a quick announcement, and through a loud cheering crowd, I took the last few. Someone asked me why I did this, and I had to think about it. I figure there are people that don’t take photos themselves, or they are just in a cycle of workshops where the person taking photos isn’t there, and they maybe don’t have a photo from camp. This way, they have at least one photo, albeit with me, but they have one. It helps us remain connected and in touch even after camp is over. I’ve also gotten into the habit of using those selfies for my Facebook profile picture on people’s birthdays. Sometimes, I change my profile picture multiple times in a day. 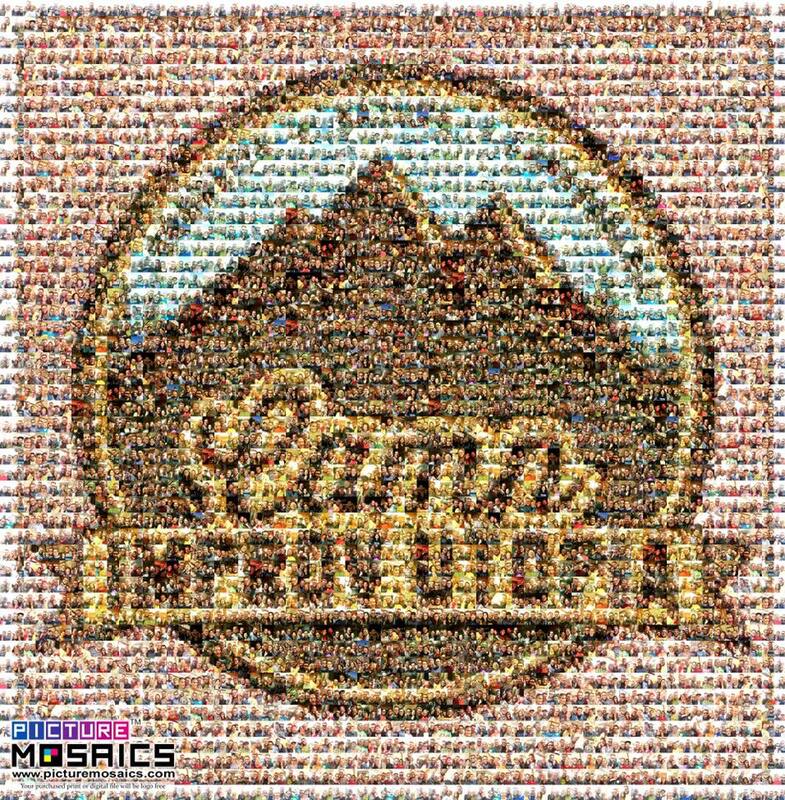 I also took the opportunity this year to compile all the selfies into a mosaic of the camp logo. This year has been one of change and self-reflection for me. Camp has helped me out a lot. At one point, I thought I might need to step away from improv for a short time, but when I really thought about it, it’s something that makes me truly happy. Camp is a great place to reinforce that happiness and joy. Why would I ever want to step back from something that makes me feel so good? I just wish everyone could experience this. I describe camp as a giant group hug and a room full of 100 or so relative strangers that wish nothing for you but your greatest success. This year, I witnessed that in three different and stunning locations across the country.